CHINO HILLS, Ca. -- Huge crowds quickly gathered at a 7-Eleven in Chino Hills, California where one of the wining Powerball tickets was sold. The California store and its surrounding strip mall immediately became a popular gathering spot in the usually quiet suburb of 75,000 people. Hundreds of people, from news crews to gawkers, crowded the store and spilled into its parking lot. They cheered and mugged for TV cameras as if it were New Year's Eve or a sporting event. Many chanted, "Chino Hills! Chino Hills!" in celebration of the city. "It's history. We're all so excited for our city," Rita Talwar, 52, who has lived in Chino Hills for 30 years, told the local newspaper, the San Bernardino Sun. 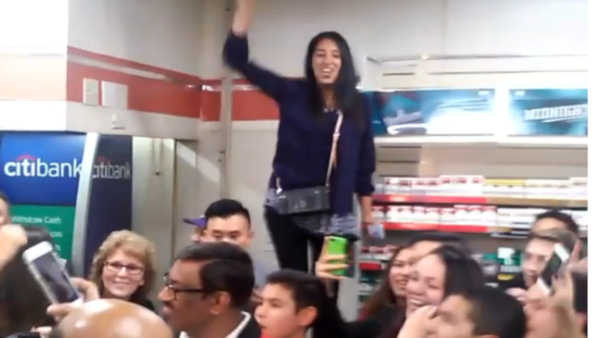 Some took selfies with the store clerk on duty, who became an instant celebrity and may well have been the man who sold the ticket after being on duty for much of the run-up to Wednesday night's drawing. "I'm very proud that the ticket was sold here," the clerk, M. Faroqui, told the Sun. "I'm very happy. This is very exciting." The estimated jackpot amounts had risen steadily since Nov. 4, when it was reset at $40 million. Texas Lottery executive director Gary Grief has said this Powerball offered "absolutely" the world's biggest jackpot.